Opposites Attract! 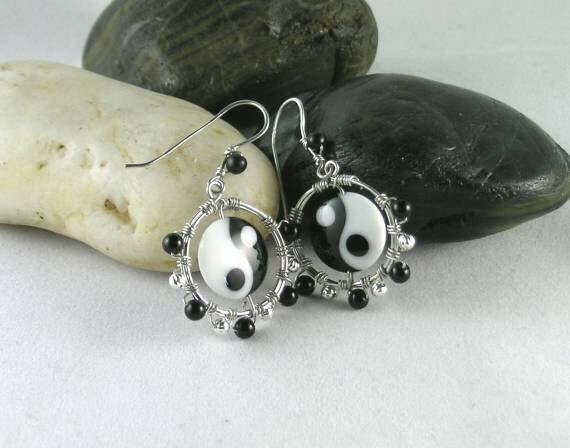 These earrings are handmade jewelry wire hoops wrapped with alternating 4mm obsidian beads and 3mm silver metal beads around the outside edge. 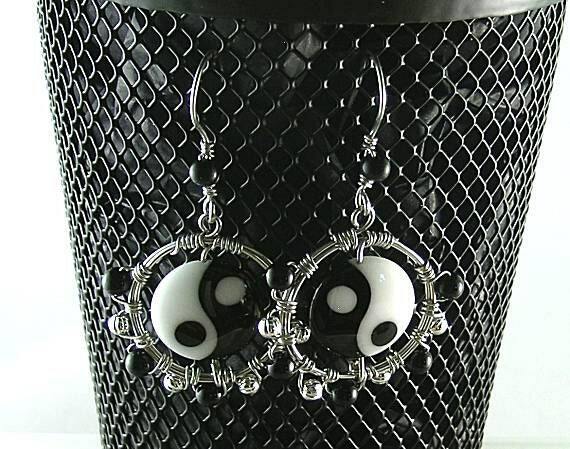 Positioned in the center is a lampwork glass bead with the yin yang symbol. The hoop dangles, including the beads, measure approx. 1 1/4" in diameter or 32mm. 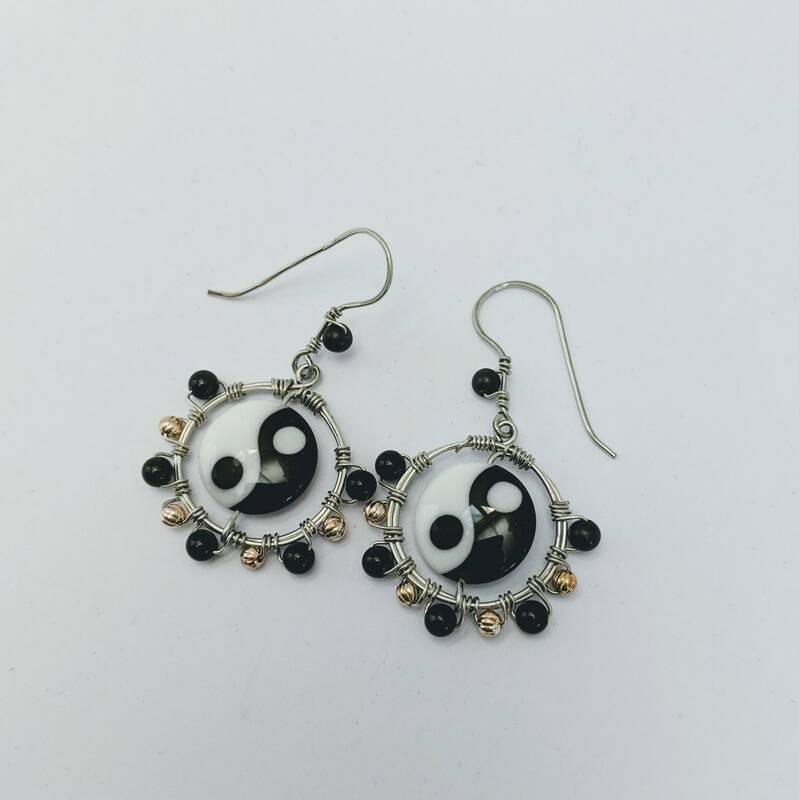 With the matching ear wires, the earrings measure approx. 2 inches. 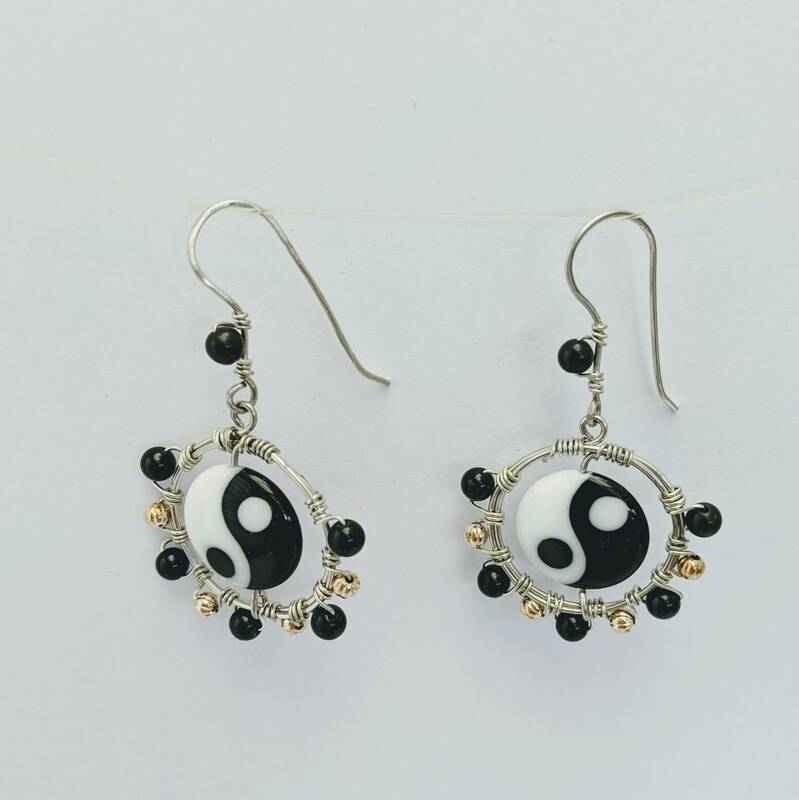 While Western culture refers to the symbol as Yin-Yang, the true name is Taijitu. 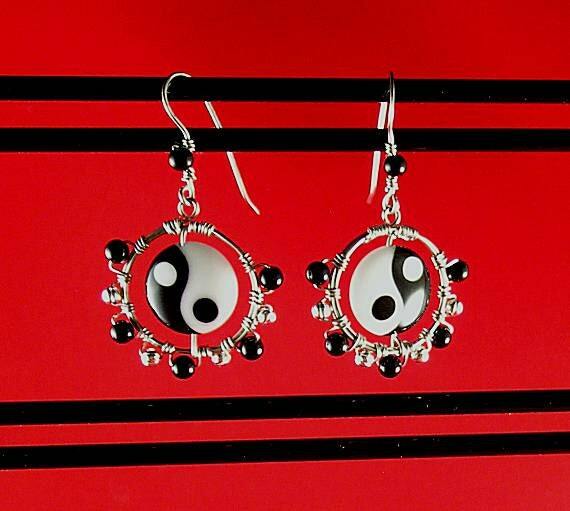 A fundamental Chinese concept, the Yin-Yang symbol represents duality. The two separate concepts Yin and Yang represent opposite ideas, which when brought together complement and complete the whole. The whole is greater than the individual parts. 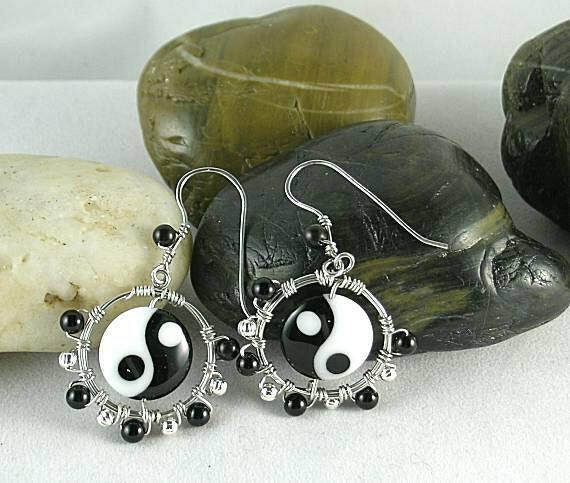 Yin is associated with night, female and South while Yang is the sun, male and North. While this seems cut and dry, the idea of interconnectedness ensures the concepts associated with Yin and Yang are dependent upon each other and therefore not inherently absolute. 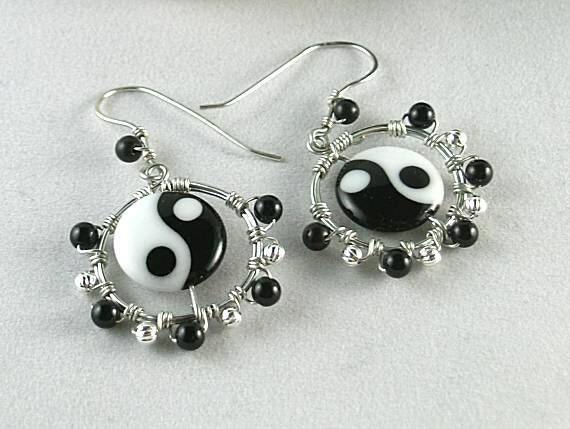 The Yin-Yang symbol has come to be associated with Taoism. Opposites thus only exist in relation to each other. This concept lies at the origins of many branches of classical Chinese science, philosophy and medicine. It is also a central principle of different forms of Chinese martial arts and exercise as well as I Ching divination. Many natural dualities e.g. dark and light, female and male, low and high, cold and hot - are thought of as manifestations of yin and yang (respectively). Obsidian is believed to help one recognize the darker side of their nature so that it can evolve and be illuminated. It protects from negativity and grounds one to the Earth's heart. The Aztecs used it for divination and called it "Tezcatilipoca" or Shining Mirror. According to legend Dr. Dee, the famous alchemist hired by England's Queen Elizabeth I, used a piece of obsidian for his scrying sessions. Obsidian is called "dragon glass" in the Game of Thrones series.